Why can words with hyphen char not be hyphenated? 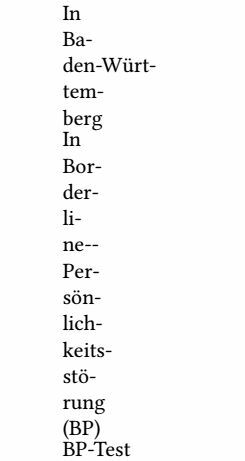 Assume I have a word like Baden-Württemberg. TeX can't hyphenate any of these two word parts. Why? where the small ticks indicate possible hyphenation points. A technical (TeXnical) explanation is welcome. BTW: I am not asking how to circumvent this (by using the babel shorthand "= for example). An explicit hyphen is a character whose character code matches the font's \hyphenchar value or a ligature that ends with such a character (that's why also -- or --- inhibit hyphenation). The T1 encoded fonts have in position 0x7F a character which is identical to the normal hyphen. Changing the \hyphenchar to denote this slot, the normal hyphen does not inhibit hyphenation any more. The \hyphenchar\font=\string"7F seems not the correct work around for this problem, since it is not font independent. Not the answer you're looking for? Browse other questions tagged tex-core punctuation hyphenation or ask your own question. How to hyphenate a reference that has a lastname with a hyphen? Enable extra hyphenation points for compound words that already contain a hyphen character? How to hyphenate properly at an em-dash? Is it still worthwhile to let TeX try line-breaking without hyphenation? Why quoted word is not hyphenated?